Manufacturing plants have one characteristic that in the past has made management more difficult. The plants use different types of machines that use diverse protocols, making it hard to design a coordinated system that can collect, analyze, and process data from all stations in the plant. 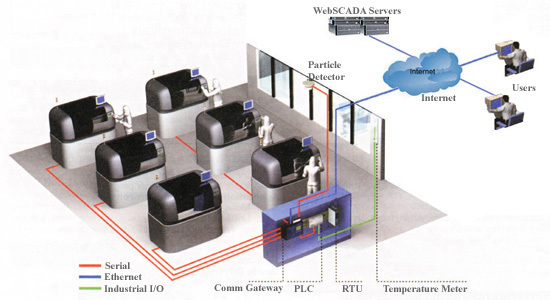 WebSCADA manufacture solutions help out by using its unique communication gateway, an embedded computer at client site, to provide an “open” programming platform for users to download their own custom protocol conversion software. The gateway computing powers can be used to do preliminary data processing before sending data to WebSCADA servers. Its one of the serial ports can also be connected to a V.90 or GPRS modem for PPP connections, and a PCMCIA port is available for wireless communication using 802.11b/g networks. Data collected in the gateway can be transferred to WebSCADA servers for real-time processing. WebSCADA manufacturing solution simplifies automation systems and reduces SCADA operational expenses by eliminating SCADA control center/room costs completely. It configures and monitors your manufacturing-information and process-automation anywhere anytime using web browsers at your choices. A unique feature of WebSCADA manufacturing solution is to use widely available Internet as communication platform for quick implementation with WebSCADA’s proprietary encryption/decryption technologies. It provides programmability at both client sites and WebSCADA servers to system integrators with great flexibilities.